"Gravity maps allow us to see inside a planet, just as a doctor uses an X-ray to see inside a patient," said Antonio Genova of the Massachusetts Institute of Technology (MIT), Cambridge, Massachusetts. "The new gravity map will be helpful for future Mars exploration, because better knowledge of the planet's gravity anomalies helps mission controllers insert spacecraft more precisely into orbit about Mars. Furthermore, the improved resolution of our gravity map will help us understand the still-mysterious formation of specific regions of the planet." Genova, who is affiliated with MIT but is located at NASA's Goddard Space Flight Center in Greenbelt, Maryland, is the lead author of a paper on this research published online March 5 in the journal Icarus. The improved resolution of the new gravity map suggests a new explanation for how some features formed across the boundary that divides the relatively smooth northern lowlands from heavily cratered southern highlands. Also, the team confirmed that Mars has a liquid outer core of molten rock by analyzing tides in the Martian crust and mantle caused by the gravitational pull of the sun and the two moons of Mars. Finally, by observing how Mars' gravity changed over 11 years – the period of an entire cycle of solar activity -- the team inferred the massive amount of carbon dioxide that freezes out of the atmosphere onto a Martian polar ice cap when it experiences winter. They also observed how that mass moves between the south pole and the north pole with the change of season in each hemisphere. The map was derived using Doppler and range tracking data collected by NASA's Deep Space Network from three NASA spacecraft in orbit around Mars: Mars Global Surveyor (MGS), Mars Odyssey (ODY), and the Mars Reconnaissance Orbiter (MRO). Like all planets, Mars is lumpy, which causes the gravitational pull felt by spacecraft in orbit around it to change. For example, the pull will be a bit stronger over a mountain, and slightly weaker over a canyon. Slight differences in Mars' gravity changed the trajectory of the NASA spacecraft orbiting the planet, which altered the signal being sent from the spacecraft to the Deep Space Network. These small fluctuations in the orbital data were used to build a map of the Martian gravity field. The gravity field was recovered using about 16 years of data that were continuously collected in orbit around Mars. However, orbital changes from uneven gravity are tiny, and other forces that can perturb the motion of the spacecraft had to be carefully accounted for, such as the force of sunlight on the spacecraft's solar panels and drag from the Red Planet's thin upper atmosphere. It took two years of analysis and computer modeling to remove the motion not caused by gravity. "With this new map, we've been able to see gravity anomalies as small as about 100 kilometers (about 62 miles) across, and we've determined the crustal thickness of Mars with a resolution of around 120 kilometers (almost 75 miles)," said Genova. "The better resolution of the new map helps interpret how the crust of the planet changed over Mars' history in many regions." For example, an area of lower gravity between Acidalia Planitia and Tempe Terra was interpreted before as a system of buried channels that delivered water and sediments from Mars' southern highlands into the northern lowlands billions of years ago when the Martian climate was wetter than it is today. The new map reveals that this low gravity anomaly is definitely larger and follows the boundary between the highlands and the lowlands. This system of gravity troughs is unlikely to be only due to buried channels because in places the region is elevated above the surrounding plains. The new gravity map shows that some of these features run perpendicular to the local topography slope, against what would have been the natural downhill flow of water. A Martian gravity map showing the Tharsis volcanoes and surrounding flexure. 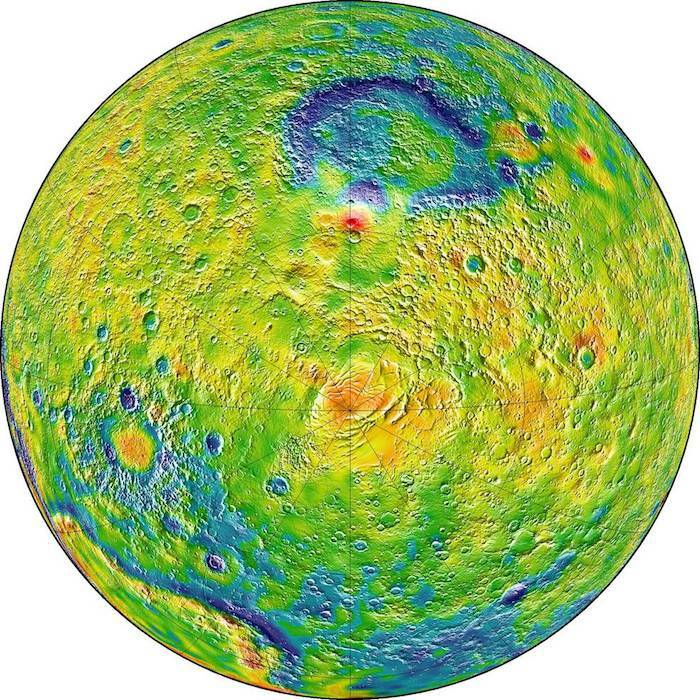 The white areas in the center are higher-gravity regions produced by the massive Tharsis volcanoes, and the surrounding blue areas are lower-gravity regions that may be cracks in the crust (lithosphere). An alternative explanation is that this anomaly may be a consequence of a flexure or bending of the lithosphere -- the strong, outermost layer of the planet -- due to the formation of the Tharsis region. Tharsis is a volcanic plateau on Mars thousands of miles across with the largest volcanoes in the solar system. As the Tharsis volcanoes grew, the surrounding lithosphere buckled under their immense weight. The new gravity field also allowed the team to confirm indications from previous gravity solutions that Mars has a liquid outer core of molten rock. The new gravity solution improved the measurement of the Martian tides, which will be used by geophysicists to improve the model of Mars' interior. Changes in Martian gravity over time have been previously measured using the MGS and ODY missions to monitor the polar ice caps. For the first time, the team used MRO data to continue monitoring their mass. The team has determined that when one hemisphere experiences winter, approximately 3 trillion to 4 trillion tons of carbon dioxide freezes out of the atmosphere onto the northern and southern polar caps, respectively. This is about 12 to 16 percent of the mass of the entire Martian atmosphere. NASA's Viking missions first observed this massive seasonal precipitation of carbon dioxide. The new observation confirms numerical predictions from the Mars Global Reference Atmospheric Model – 2010. The research was funded by grants from NASA's Mars Reconnaissance Orbiter mission and NASA's Mars Data Analysis Program. 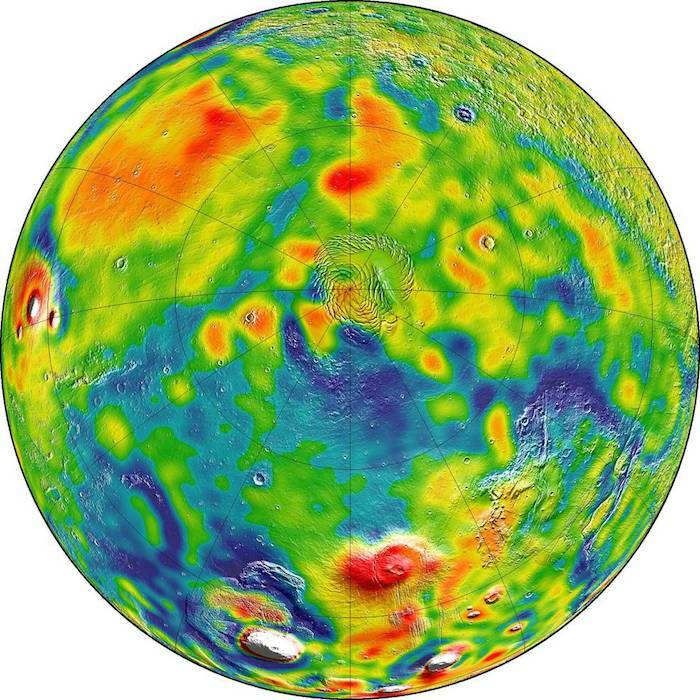 The colorful new map shows how Mars' gravity varies across the planet. White regions show higher-gravity zones, most notably the Tharsis volcanoes, while blue areas show lower-gravity zones like canyons. NASA has released a stunning new map of Mars that shows the planet’s terrain in a way not visible to the naked eye—using gravity to reveal new details about everything from the core to the atmosphere. To reveal Mars’ gravitational wrinkles, MIT’s Antonio Genova and his colleagues analyzed 16 years’ worth of tracking data from three Mars satellites, looking for telltale wobbles in their positions and velocities caused by variations in the planet’s tug. The end result, published on March 5 in the scientific journal Icarus, tracks these extremely slight differences from the heights of the Olympus Mons volcano, the tallest in the solar system, to the depths of the Valles Marineris canyon system. Perhaps the study’s biggest finding is that gravity is an excellent weather-tracking tool. By watching the fluctuating gravity of Mars’ frigid polar caps, Genova and his colleagues confirmed that during northern winter, up to 4 trillion tons of carbon dioxide freezes out of the atmosphere and piles up at the pole. The same thing happens at the southern pole during that hemisphere’s winter. This seasonal gas migration involves about one-sixth of Mars’ atmosphere by mass. What’s more, the team was able to gravitationally track the planet’s CO2 cycle over 16 years, letting the researchers see how the solar cycle—the sun’s roughly 11-year rise and fall in activity—affected the gas’ movement. Their calculations largely match up with real-world measurements collected by rovers on the Martian surface. “From our data—spacecraft that orbit about Mars—we’re able to measure the variation of the mass of the polar caps, and [this approach] basically can give us another view [of] how the climate on Mars evolved over the past billion years,” says Genova. The new map also helps to explain a “gravity trough” that lies in Mars’ northern lowlands, between the Tempe Terra highlands and the Acidalia Planitia plains, the setting for the sci-fi book and movie The Martian. Previous studies had identified the trough—a north-south patch of anomalously low gravity—as a huge waterway that once transported water and sediment but was later buried by the massive eruptions of Mars’ Tharsis volcanoes billions of years ago. The new analysis shows that the “trough” follows the geological boundary between Mars’ wildly different northern and southern hemispheres—revealing it to be a wrinkle in Mars’ crust created when the Tharsis volcanoes belched out enormous amounts of lava. The new analysis wasn’t just skin deep: Using the same data, researchers could also see how much the sun and Mars’ moon Phobos gravitationally stretch the red planet. Confirming a landmark 2003 study, they found that Mars’s observed elasticity is best explained if the planet has a liquid outer core between 3,400 and 3,600 kilometers wide. Inside Earth, a liquid outer core helps power the dynamo that gives our planet its protective magnetic field. Genova’s result might help clarify the tragic history of Mars’ magnetic field, which went from a full-fledged shield like Earth’s to nothing but a skin-deep residue on its southern hemisphere. Without a strong, planet-wide magnetic field, streams of particles flung off the sun could have more readily blown away much of early Mars’ atmosphere, destroying the planet’s ancient oceans—and perhaps dooming any nascent Martian life. Mighty impressive, for a model based on three satellites’ subtle orbital wiggles.